On a whim, my 5 year old recently picked out some yellow beets at the market, and said “Let’s cook these, mommy!” Who could say no to that?! 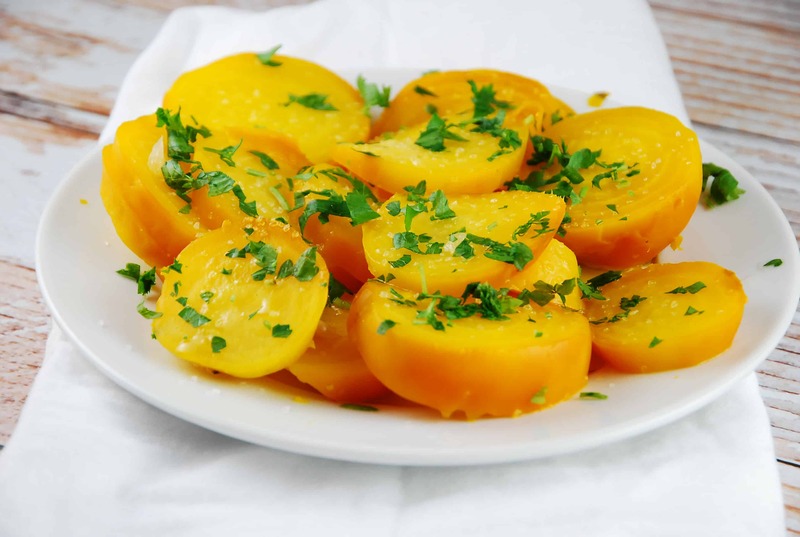 And having always used red beets in my cooking, I was thrilled to try the yellow this time instead. Roasting beets is such an easy task, and the result is deliciously, sweet and tender beets that take on an entirely different flavor during the roasting process, as opposed to boiling them or eating them raw. I love serving them as a simple, yet deliciously nutritious side dish recipe with many meals, but I always roast extra and save them as salad toppers for later in the week. This roasted beets recipe is a simple version that really beings out the perfect, natural flavor of the beets. A little bit of lemon juice, coarse sea salt and drizzle of olive oil is all it needs…these are excellent! Sweet, salty, tender yet firm, these roasted beets are a true delight. Perfect to eat alone as a healthy vegetable side dish or to top salads with. Place beets on a piece of aluminum foil. Small beets can be wrapped together, but it’s best to wrap large beets individually. Wrap the beets loosely in the foil, and place them in a large baking dish. Place beets in the oven and roast for about 45-60 minutes, or until the beets are tender (check them about every 20 minutes). Let the beets cool enough to handle. Hold one of the beets in a paper towel and use the paper to rub the skin off. Repeat with remaining beets. Slice beets and place on serving platter. Drizzle with olive oil and lemon juice, then top with salt, pepper, and fresh parsley. If beets are no points and 1 tablespoon of olive oil is 3points how can this be 2 points a serving or 8 points total?